Screen Connect offers an array of useful connection and remote control features. Despite the intricate functions you can perform, the system is easy to use and requires no downloads or installations for clients. This makes for a quick and simple service to help fix problems remotely. 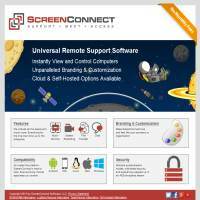 Take a look on ScreenConnect.com and you’ll find a section outlining their remote support features. This is extensive, offering details on connectivity, session management, in-session tools, customization options and security features. Each of these categories has around 15-20 features, and none of them seem superfluous. They have a function, and add something to your experience. Essentially this software allows you to gain control over one or multiple computers. You can choose to allow the person on the other end to interact, watch, or simply cut off their screen and work in peace. There are communication tools so you can talk through what you’re doing, which is handy if you’re planning on training colleagues, or wish to work on collaborative projects. Users with managerial status are able to see what’s going on across the network in order to analyse the efficiency of the system, as well as preventing particular computers from accessing particular files. The level of control is solid, although perhaps not quite as in depth as you can find elsewhere. Still, those more manager-focused systems tend to be much more complex. In terms of price, it’s a bit hard to comment on the value of the licenses because the site doesn’t tell you how long they last. We assume contracts last one year, because the “upgrade” section outlines that you receive new releases “for an additional year”. As such, this is a slightly expensive service, but still offers good value considering the variety of useful tools on offer. There’s a 30 day trial on offer for free, which is a great way to get a feel for the services on offer. This allows full access to all of the features, so we’d recommend trying it out. From there it’s easy to purchase a license, though it’s probably worth chatting with the sales team to find out how flexible they are because the site only recommends an upper tier of 10 or more (how many more they can cater to is another question completely). The software supports Mac, Windows and Linux, as well as mobile devices. They also support a number of methods which allow unattended clients, and you can use the ScreenConnect application, which lets each member of a remote access event see what’s happening. Non-admin users can easily join events, and you can control a computer to restart in safe mode if necessary. If you fancy customizing your connections to suit your particular brand or style, there are more than 300 options for this on ScreenConnect.com. This is extensive, and provides more creativity than we’ve seen elsewhere. You can subsequently produce a stylish interface for each end of the connection. With so many useful features, we’re willing to forgive the slightly high price tag here. Performance is another issue entirely, though, and we’d recommend trying out the free trial to find out if everything runs as smoothly and effortlessly as is claimed.